The humidity and the heat. Wham! And it seems like all the buildings are made of brick — which doesn't really help with the hot weather. Then there's the cacophony of cicadas, or whatever those noisy things are, and our deep love of some good barbecue while listening to Cardinal baseball on the radio, drinking a beer. You gotta love Mike Shannon. Yep. There's a lot to dig about the STL. But many things aren't as obvious. Like our fascination with where we went to high school, our outright acceptance (and approval!) of thin crust pizza and provel cheese -- and that culinary mistake/masterpiece, the Gooey Butter Cake. Cue SFX of angels singing. Well, there are the games we play while hanging out in the backyards of our brick bungalows drinking Busch and Buds to ward off the heat while listening to a Cards game to drown out the cicadas. Okay, so I don't actually know anyone who drinks Busch beer. The Anheuser-Busch brewery is now owned by a Belgian-Brazilian company, and more and more of us are enjoying high-quality custom libations from the many new microbreweries that have popped up recently. Life is good. Anyway, backyard games! We love 'em. Especially ones that involve throwing something at something while drinking something. Here's a fun visual overview of some of our favorites. 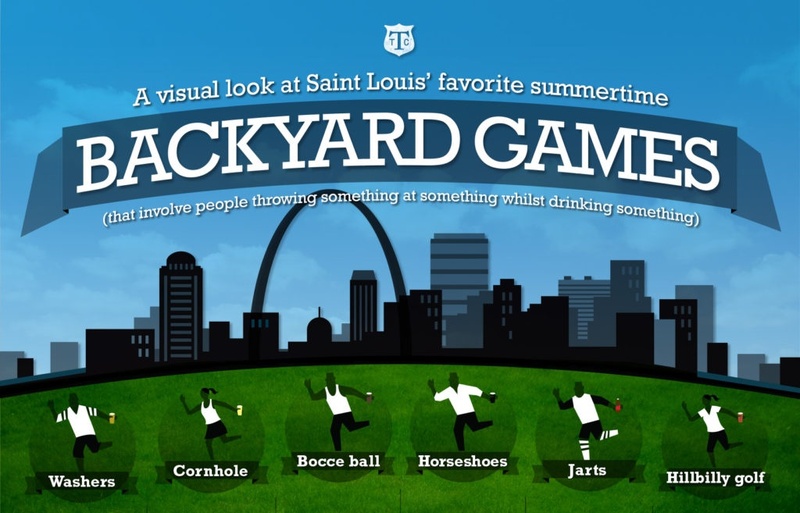 You can download an 8MB PDF version: STL's favorite backyard games. So go crazy folks, go crazy! Are there any other backyard games you like?